Rancho Marino; Cambria is located in the Central Coast region of California, in the Kenneth S. Norris Rancho Marino Reserve (part of the University of California Research Reserve Network). 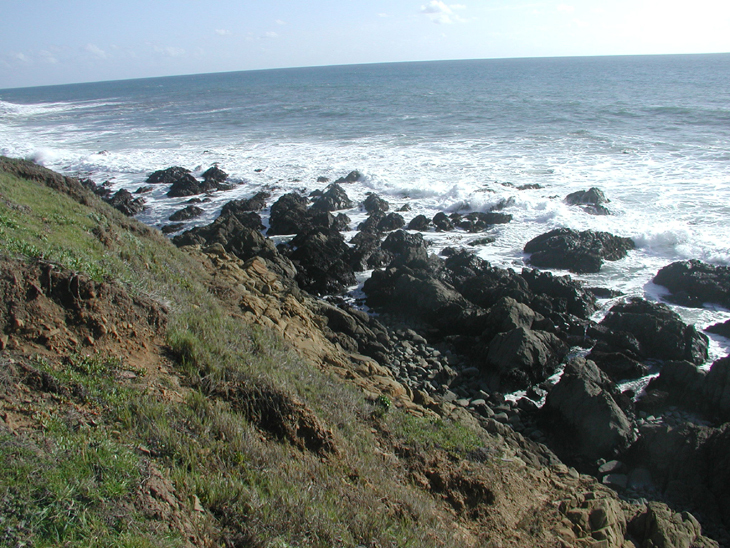 The site is located within the White Rock (Cambria) State Marine Conservation Area. Access to the site is restricted due to its location on the UC Reserve. This moderately sloping site consists of consolidated bedrock benches and large boulders separated by surge channels. Rancho Marino; Cambria is dominated by a mixture of consolidated bedrock and boulder fields, and the area surrounding the site is comprised of a mixture of consolidated bedrock, boulder fields, and cobble beach. The primary coastal orientation of this site is south/southwest. Long-Term Monitoring Surveys at Rancho Marino; Cambria were established in 2001, and are done by University of California Santa Cruz. Water temperature is monitored at this site. Biodiversity Surveys were done by University of California Santa Cruz in 2001 and 2005. The Biodiversity Survey grid encompasses one section that is approximately 29.6 meters (along shore) x 33 meters (seaward). Click here to view Biodiversity Survey findings at this site. For more information about Rancho Marino; Cambria, please contact Pete Raimondi.